Border Residents Remain Skeptical About The Need For An Expanded Wall Residents along the Southern border with Mexico are not convinced that a longer and strengthened barrier will have much of an impact on their own safety and on border security. 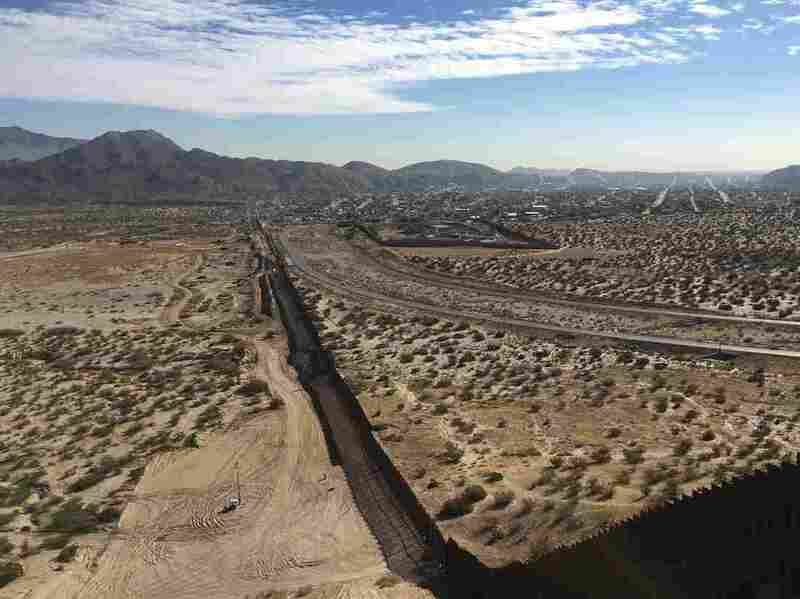 A newly constructed steel border wall divides the town of Sunland Park, N.M., from Anapra, in Mexico north of the city of Ciudad Juárez. At Ardovino's Desert Crossing, an Italian restaurant in southern New Mexico, it's not unusual for diners to look up from their gnocchi and see Border Patrol agents outside aiming flashlights at footprints on the ground. "Sometimes, it definitely feels like a movie out here," said the restaurant's co-owner, Marina Ardovino. From the top of an open-air deck on her property, the international boundary between the U.S. and Mexico is clearly visible. A dark-colored barrier cuts down a desert mesa like an iron ribbon. The old chain-link fence that used to separate the two countries was recently replaced by a tall curtain of steel slats, the kind President Trump discussed in his Oval Office address. Ardovino is not impressed. "It's hard for me to be polite with what I truly think about that," she said. "I just think the border wall is such a ridiculous waste of money." It's hard for me to be polite with what I truly think about that. I just think the border wall is such a ridiculous waste of money. In her 21 years running the restaurant in Sunland Park, Ardovino says she has never felt unsafe. She laments that her two dogs were run over by speeding Border Patrol agents but says she still cooperates with agents when they look for migrants on her property. The restaurant's open deck is a wedding venue, where couples say their vows with the border wall as a backdrop. Despite the wall, Ardovino said, migrants still make it over. "They're still crossing through. The people that I've come in immediate contact with, they want some water and a phone," she said. Urban residents along the border, from San Diego to Texas, have lived with some form of border wall for years. The newest versions are typically 18-foot-high steel fences — some mesh, others slats — that went up after Congress passed the 2006 Secure Fence Act. While these barriers have helped reduce foot traffic and crime in some neighborhoods, they've made a less tangible impact in others. And not everyone is convinced that these walls have made them safer. Just down the road from Ardovino's, Isabel Marshall lives along a row of trailer homes about a two-minute jog from the border. Twenty-five years ago, she says she floated into the U.S. from Mexico on a tire over the Rio Grande to find jobs cleaning American homes and picking American crops. She later married an American and is now a naturalized citizen. "A lot of money is spent on the wall," Marshall said in Spanish. "There's other things, like schools and hospitals, that benefit us more." Marshall also wishes she had access to more affordable health care. She said she can't afford to cover her 21-year-old son, who has severe depression, under her employer's medical plan. A congressional delegation visiting the border this week characterized the situation here not as a security crisis, but as a humanitarian crisis. The latest arrivals are mostly Central American families fleeing violence and poverty. "We confuse border security and immigration as one and the same," said retired Border Patrol agent Victor Manjarrez. "And they're not." Manjarrez is now the associate director of the Center for Law and Human Behavior at the University of Texas at El Paso. He worked at Border Patrol's national headquarters in the early 2000s, when the border was more porous and the agency asked President George W. Bush to double its manpower and build 700 miles of fencing. Back then, apprehensions at the Southern border topped a million people per year, among the highest ever recorded. "The problem we face since then, and we continue to face it today, is no one defines what success looks like," Manjarrez said. Today, apprehensions are at a 20-year low, the State Department reports there is no credible evidence of terrorists moving across the Southern border, and the more harmful narcotics, like methamphetamines, are smuggled mostly in vehicles through the official ports of entry. For Manjarrez, expecting a fully sealed border is as unrealistic as expecting a city to eliminate all crime. Building a wall, he said, is not a blanket solution. "There has to be a right mix, and it's really three things," he said. "It's a mix of that infrastructure, personnel and technology." This week, all nine House representatives who serve the Southern border, including one Republican, told CBS News that they oppose funding President Trump's border wall.